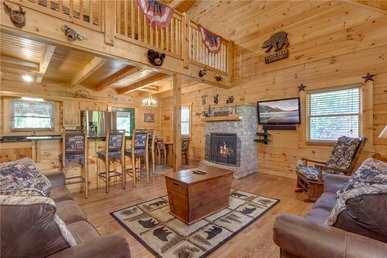 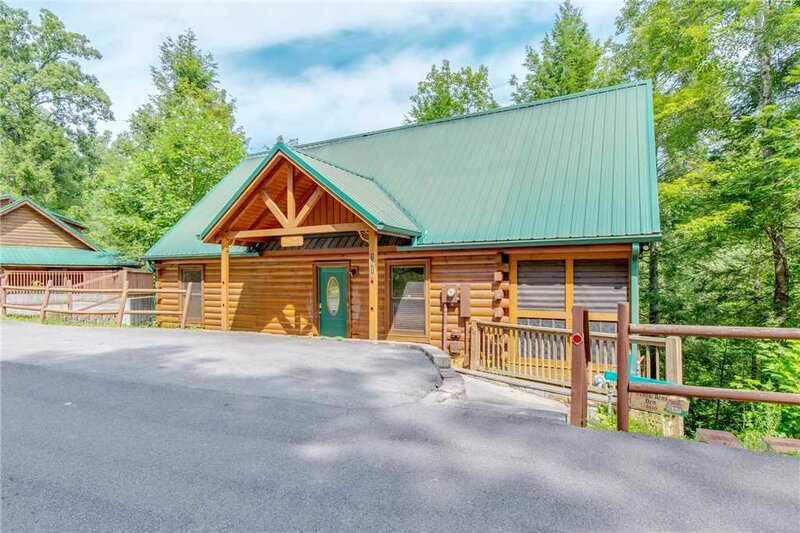 From the outside, Gentle Ben’s Den looks like a typical Smoky Mountain log cabin, albeit a spacious and exceptionally well kept one. 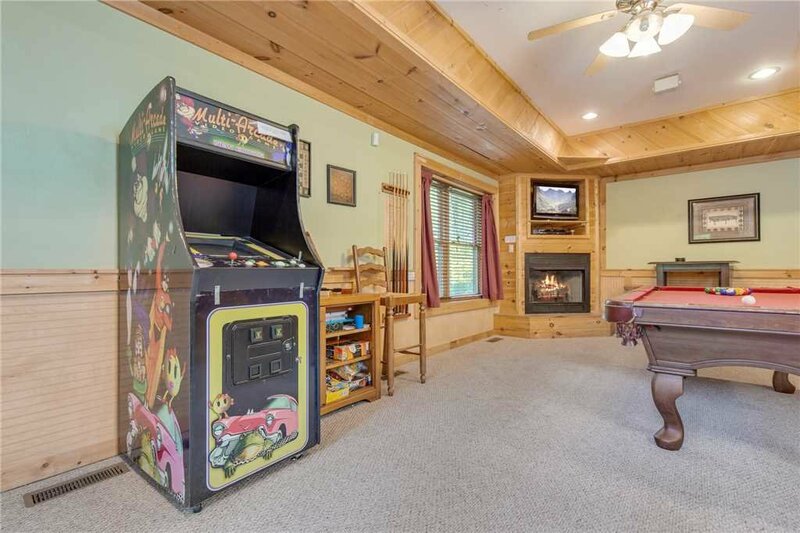 Inside, though, the lodge is packed with luxuries, including a sauna, a Jacuzzi, a pool table, foosball, air hockey, a multigame arcade, four bedrooms with king-size beds, free WiFi, and unlimited long-distance domestic calls. 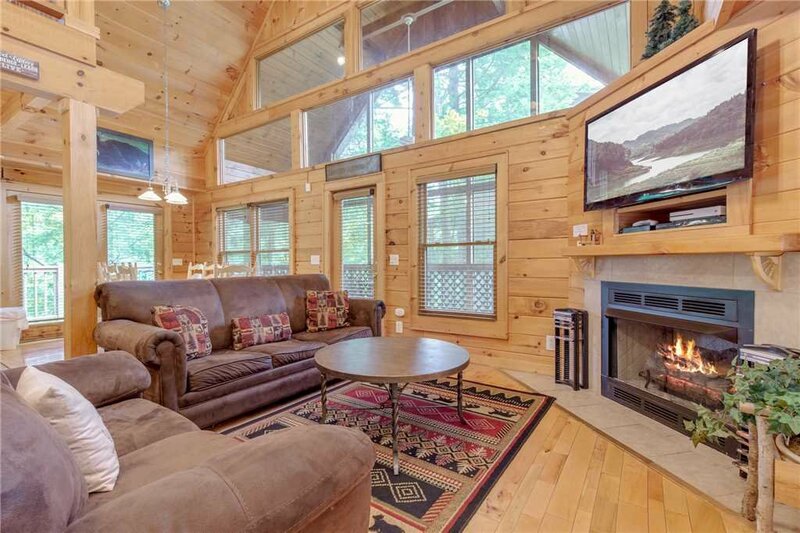 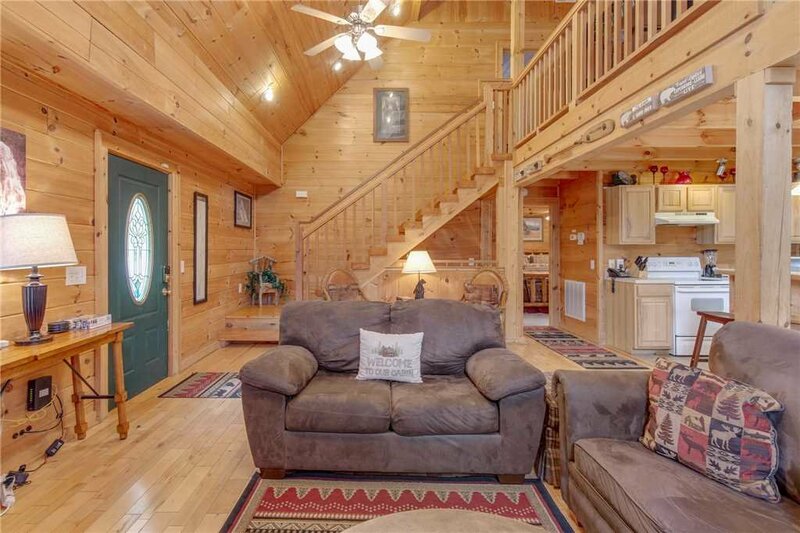 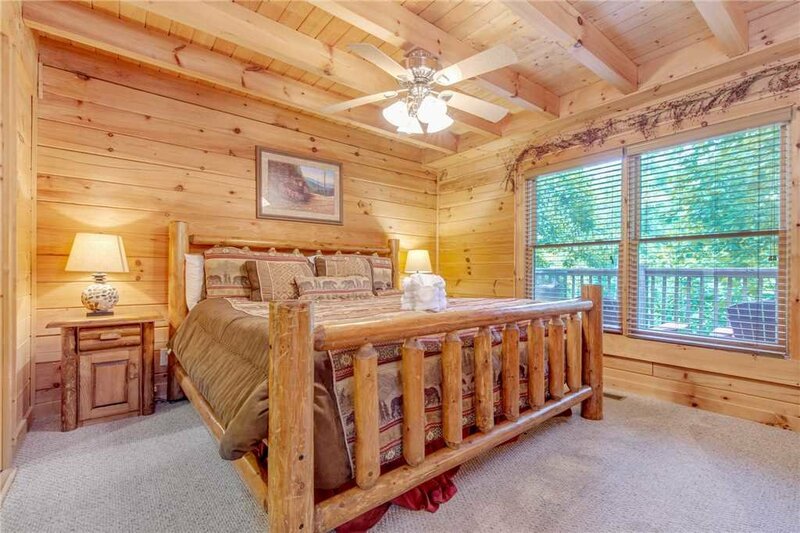 Each of Gentle Ben’s Den three stories has a deck overlooking the surrounding woodlands. 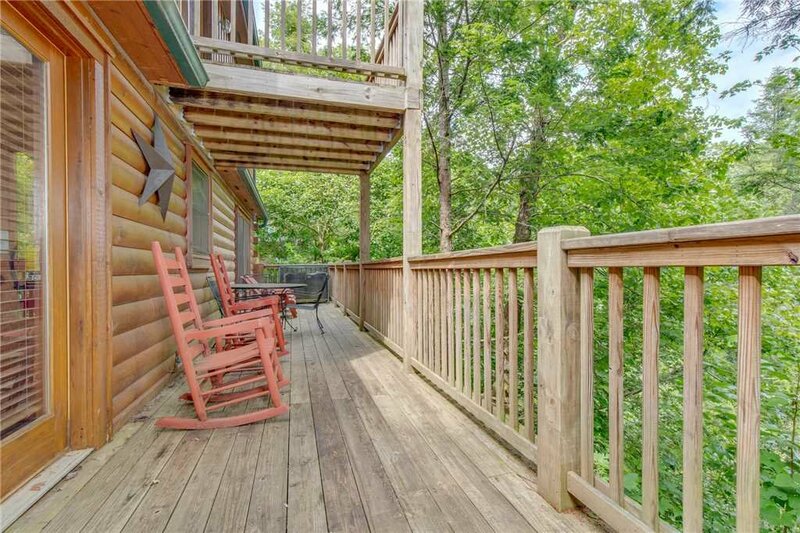 Of course, they have Adirondack chairs and rockers—a Smoky Mountain must!—so that everyone can kick back and admire the kaleidoscopic foliage in autumn and the lush greenery in spring and summer. 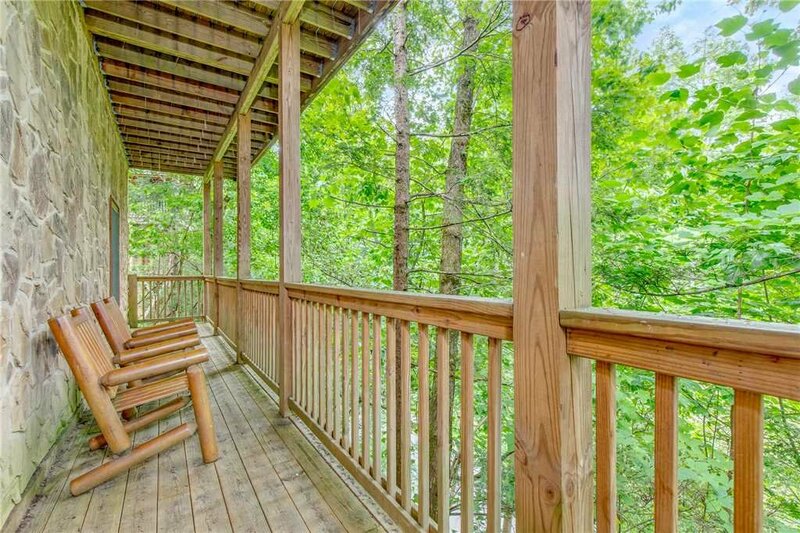 In addition to the deck, which spans the width of the cabin, the main level has a screened-in porch. 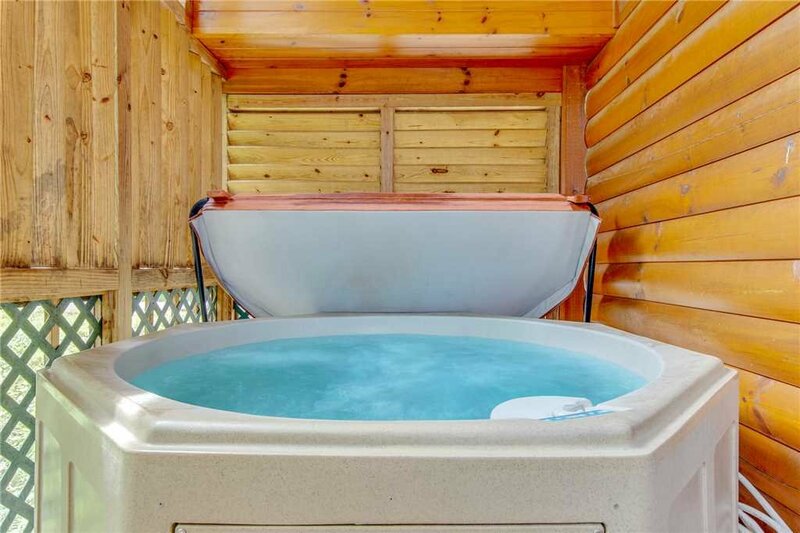 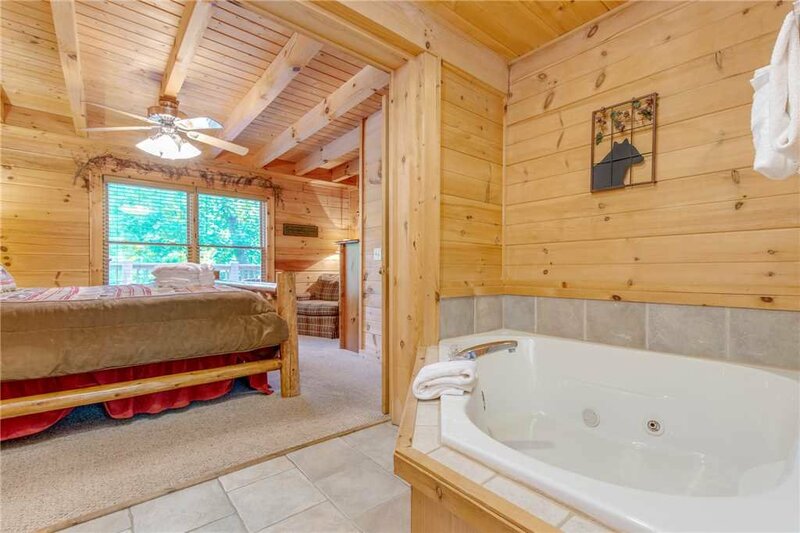 Here’s where you’ll find the hot tub, a favorite place to unwind after a day spent hiking or biking in the mountains. 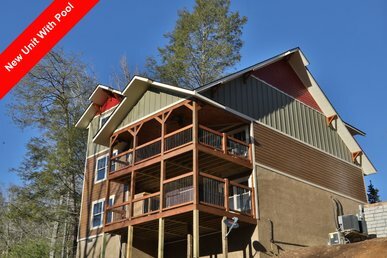 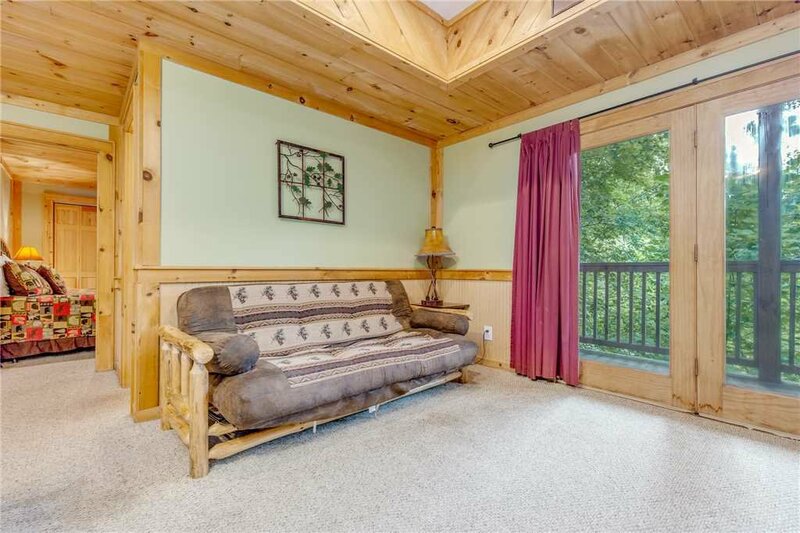 You can access both the screened-in porch and the deck from the main floor’s great room. 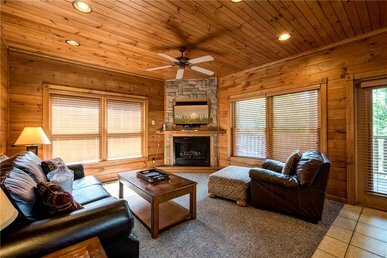 Many of the wood furnishings were crafted by local artisans specifically for Gentle Ben’s Den, adding to the sense that this is indeed a very special cabin. 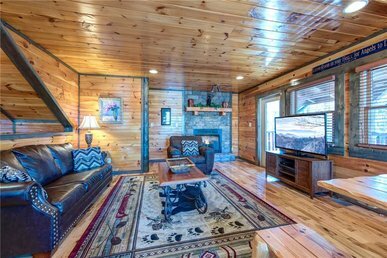 The living area’s sofas are ideal for gathering with the others to watch a movie on the 50” HDTV—there’s premium cable as well as a Blu-ray player—or sip après-ski beverages in the golden glow of the fireplace. 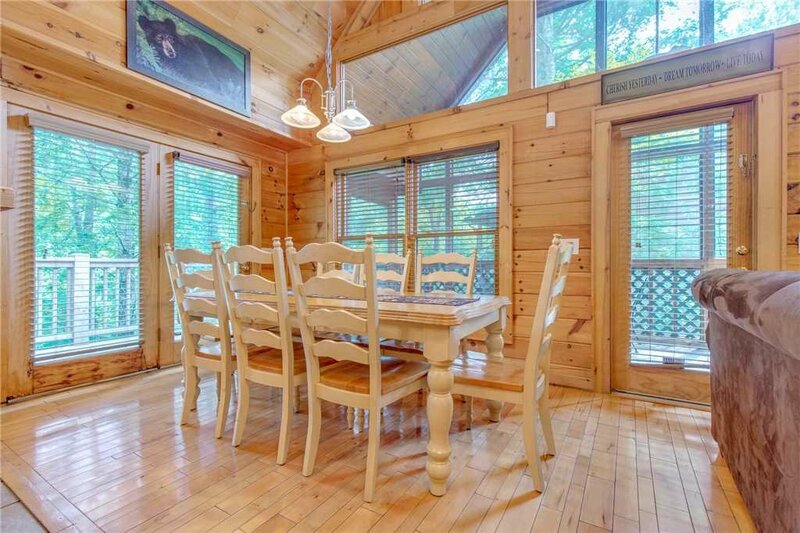 The dining area can seat up to ten people: eight at the handsome wood table and two more at the breakfast bar. 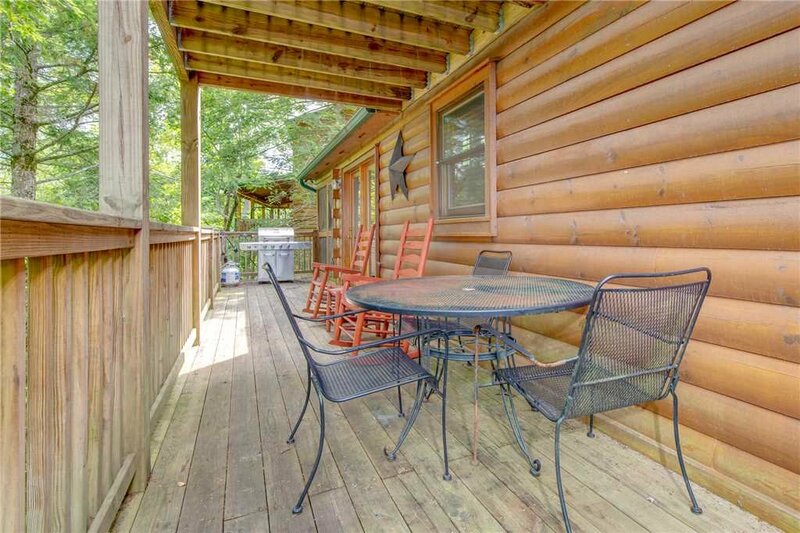 The deck has a bistro table as well, where you can enjoy an alfresco lunch or linger over drinks with friends beneath the starry night sky. 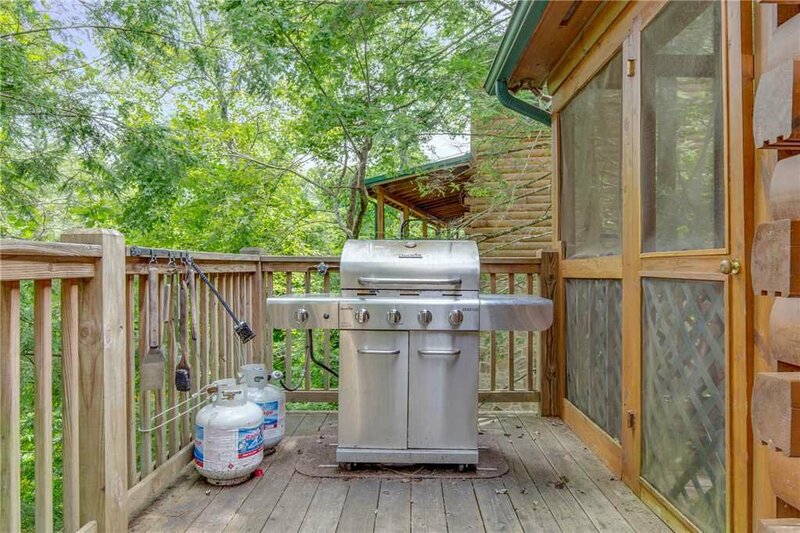 Also on the deck is a gas grill, because when the days are long, the breezes are fresh, and the songbirds are putting on a concert, there’s nothing like barbecuing in the open air. 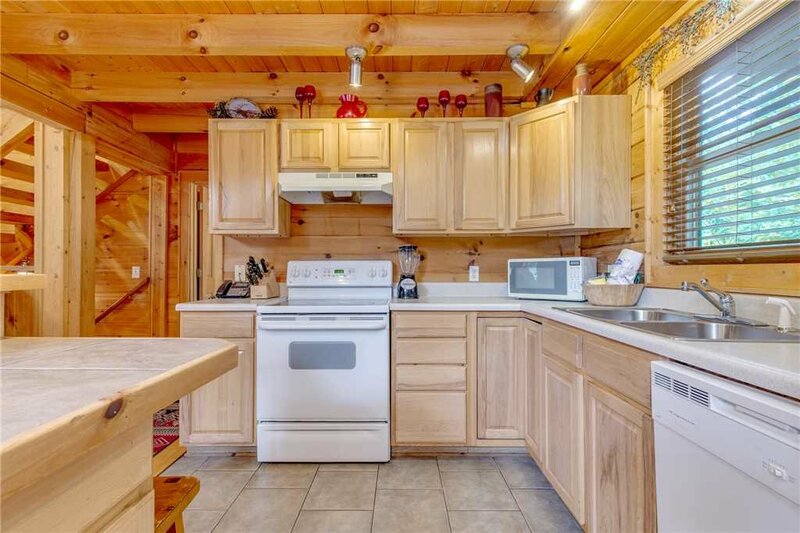 The kitchen of Gentle Ben’s Den is fully equipped to cater to all your other culinary needs. 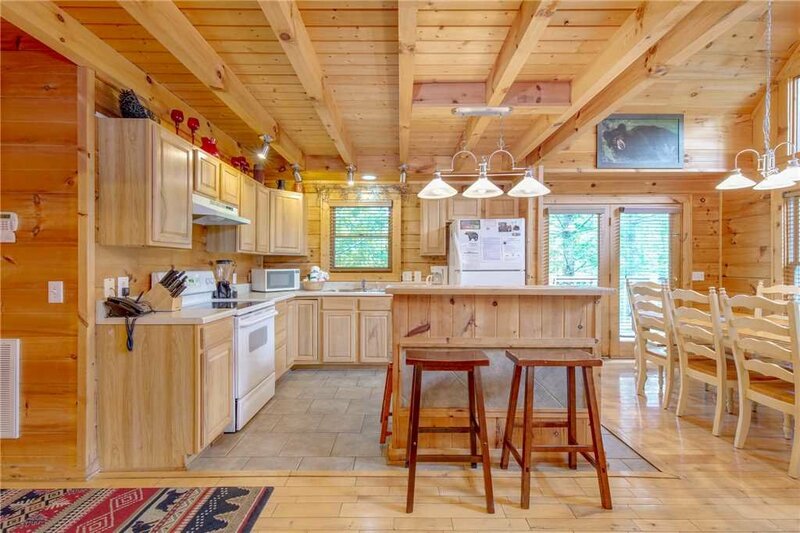 Open and spacious, it features a whole gamut of appliances, from refrigerator/freezer to blender, cookware, and tableware. 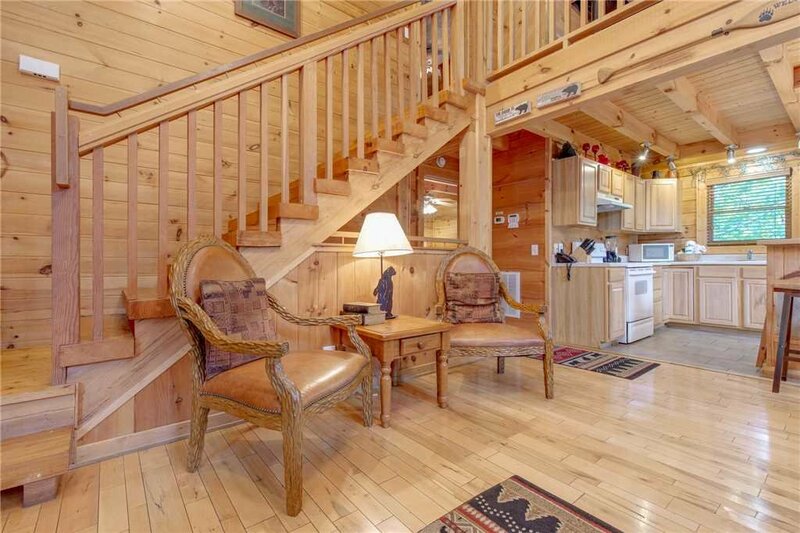 And if cooking isn’t part of your dream vacation, rest assured that scores of restaurants are just a few minutes away. 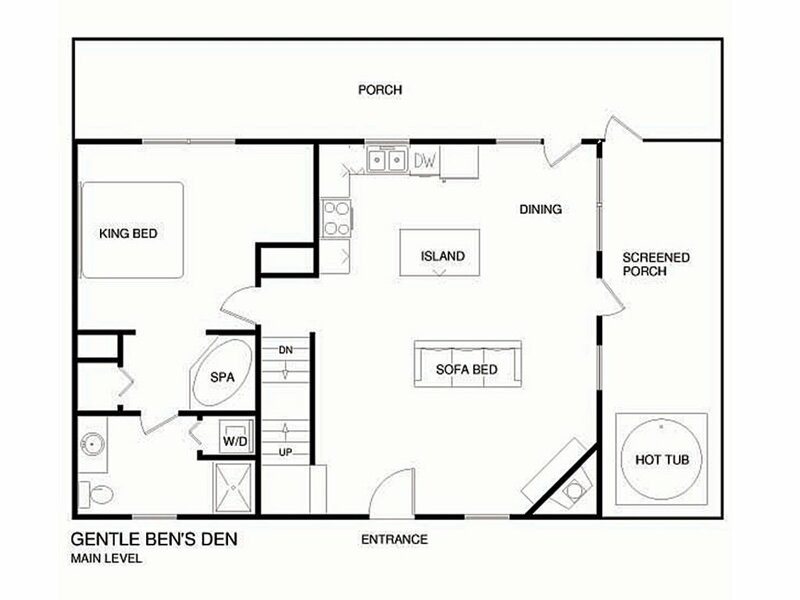 The master suite, like the great room, is on the main floor of Gentle Ben’s Den. 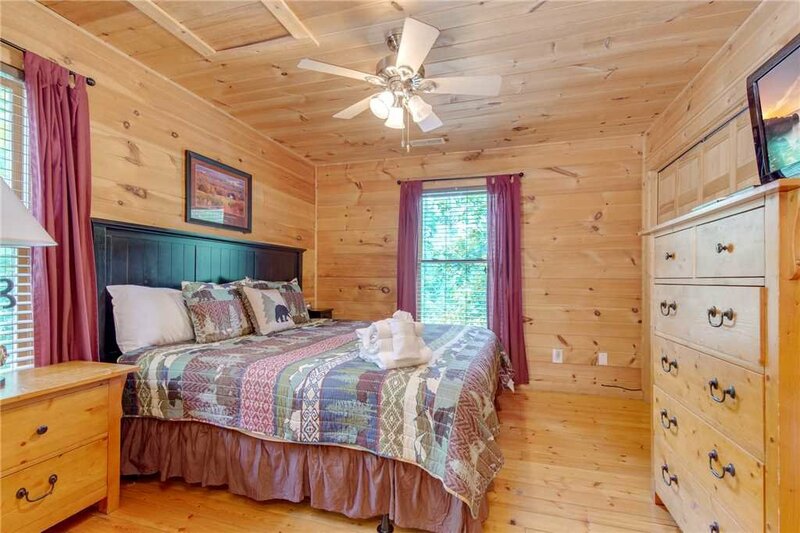 Like the three other bedrooms—1 upstairs and two downstairs—it includes a sumptuous king-size bed and a flat-screen TV. 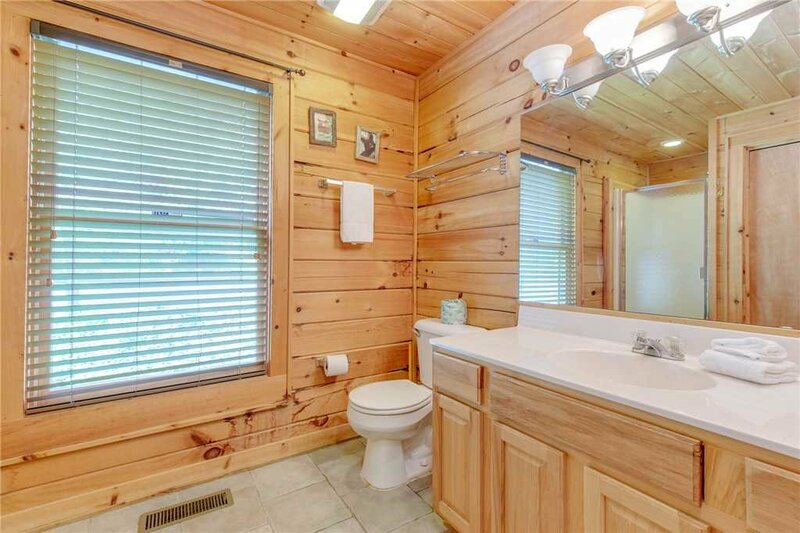 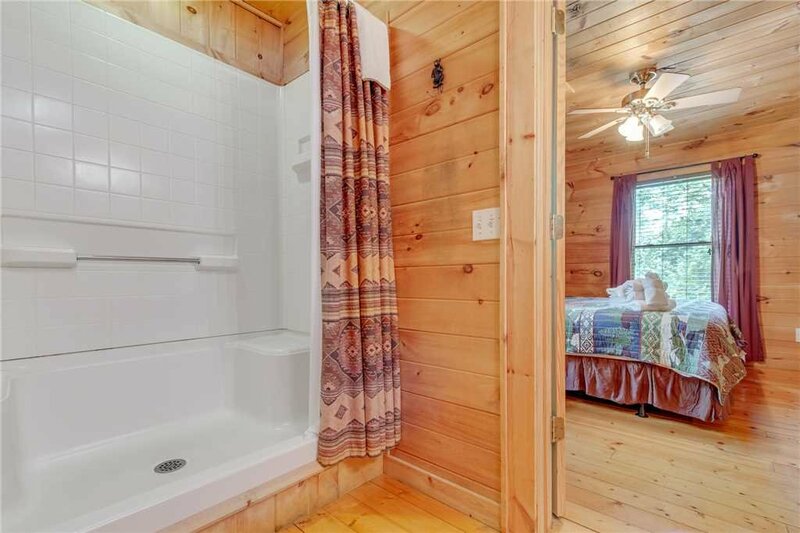 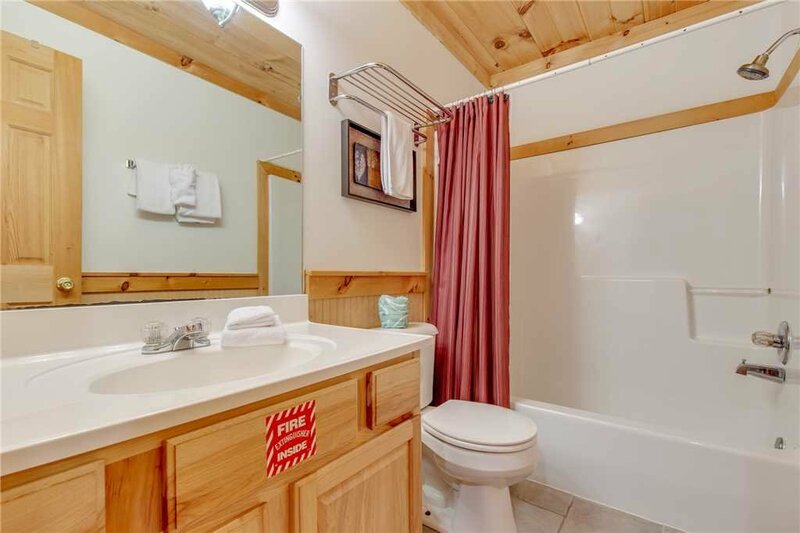 The master bedroom has a bonus: a private bathroom with a Jacuzzi as well as a shower. 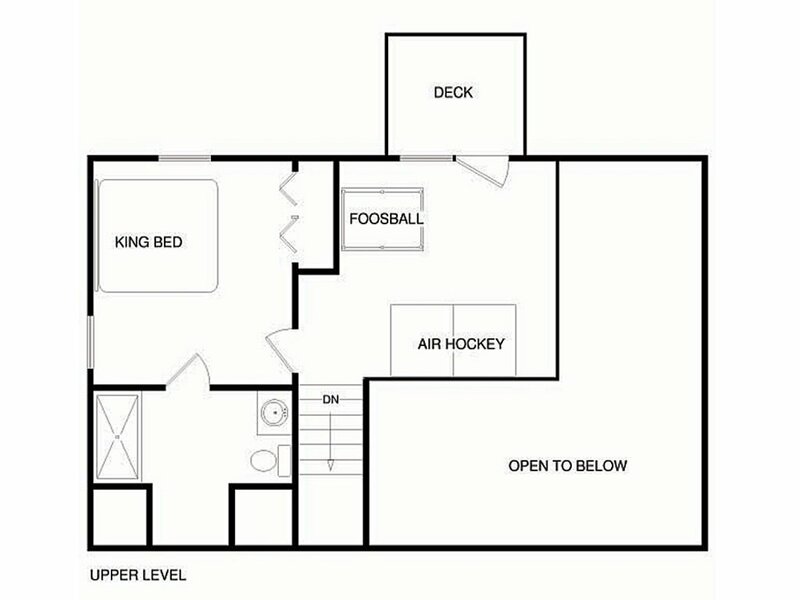 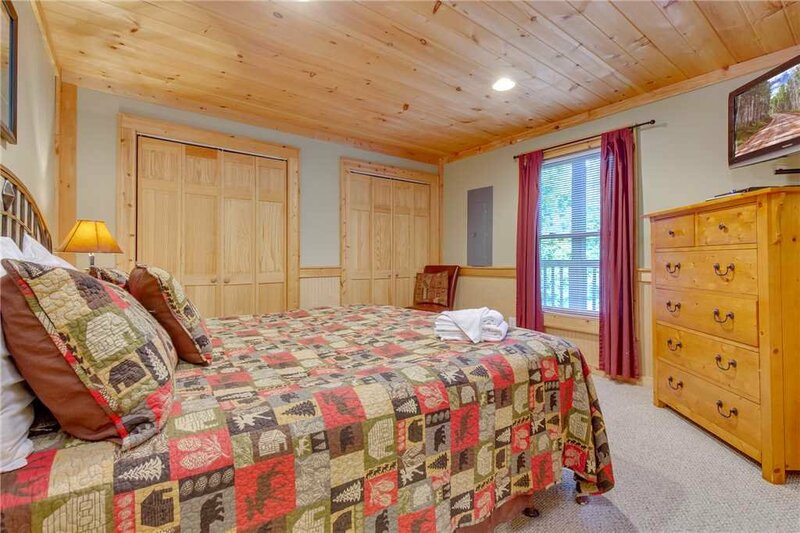 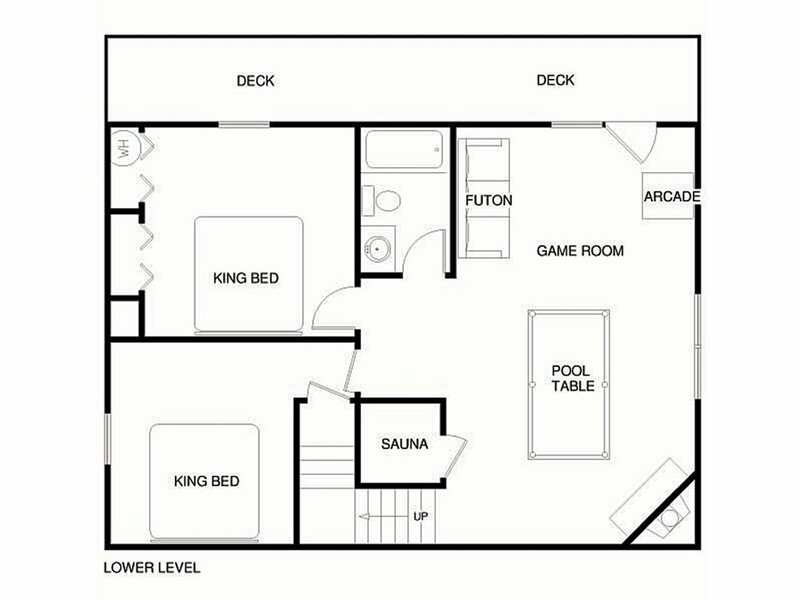 In addition to two bedrooms and a full bathroom, the lower level has one of the lodge’s two game rooms. 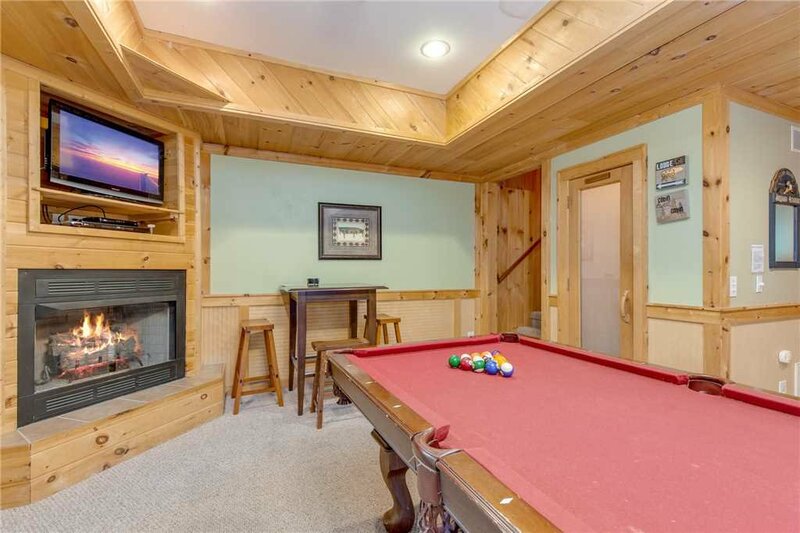 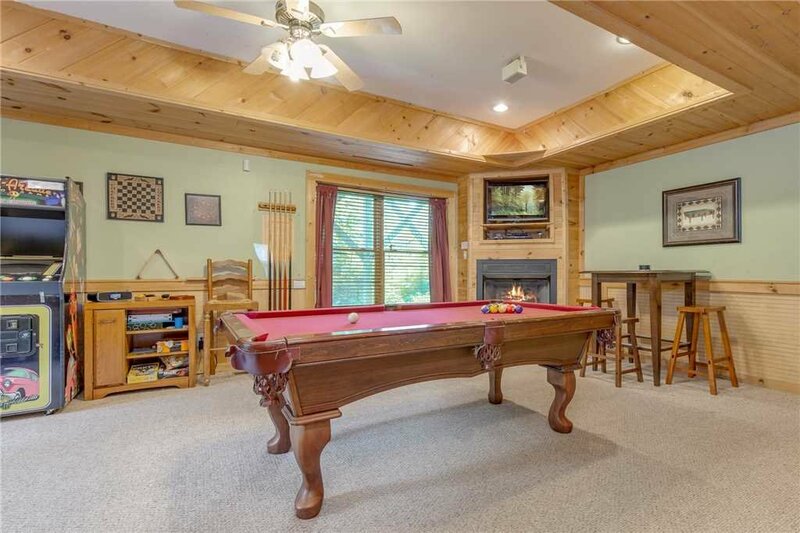 You can shoot pool here by a fireplace, challenge yourself at the multi-game arcade, play cards at the pub-style table, or stretch out on the futon and watch TV. 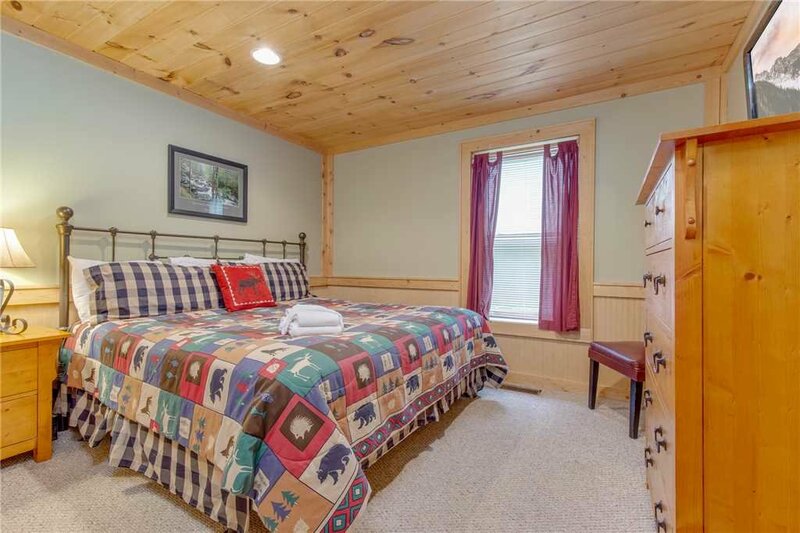 The futon, by the way, opens into a bed for two, as does one of the great room’s sofas, enabling Gentle Ben’s Den to sleep as many as twelve people. 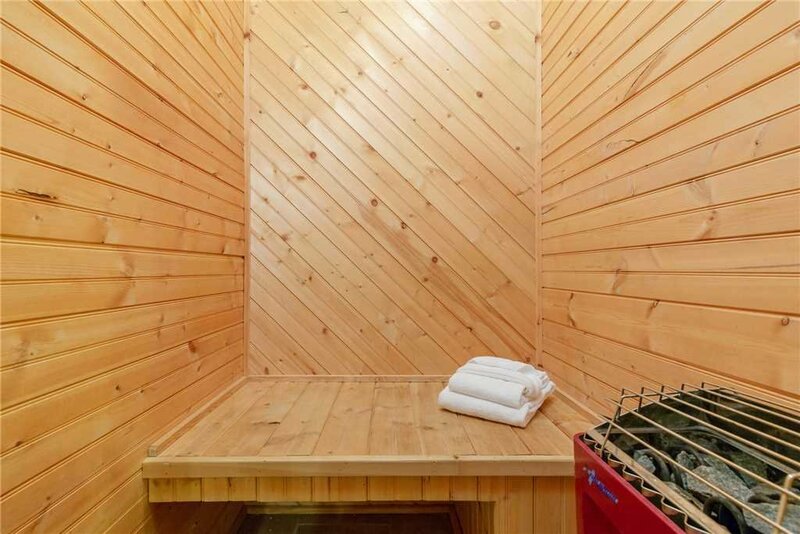 Also on the lower level is a truly pampering treat: a sauna! 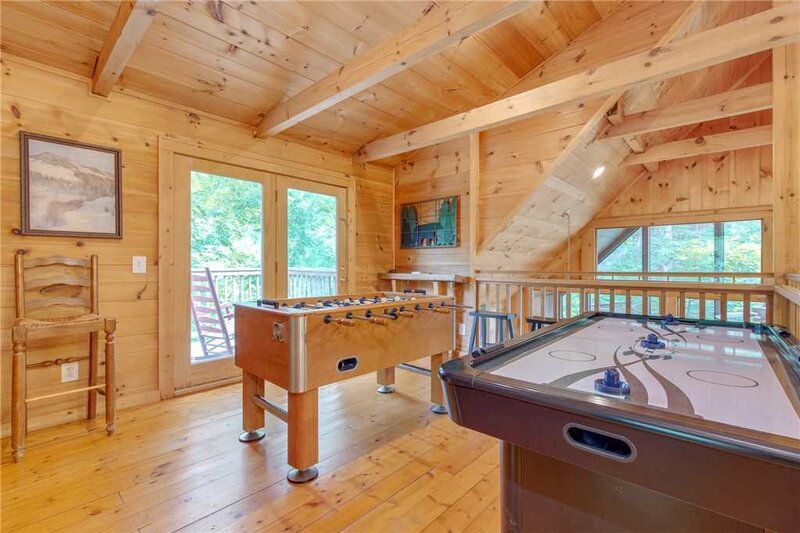 The second game room, on the loft level, includes the air-hockey and foosball tables. 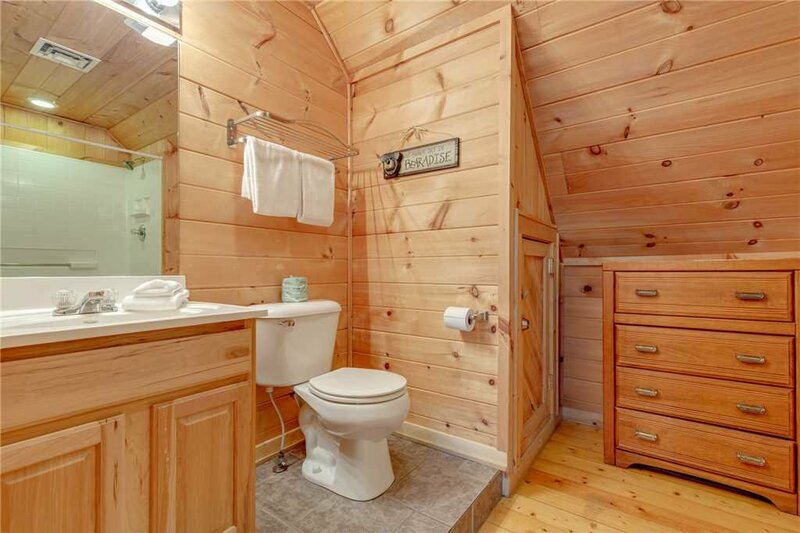 The other room up here is another en-suite bedroom. 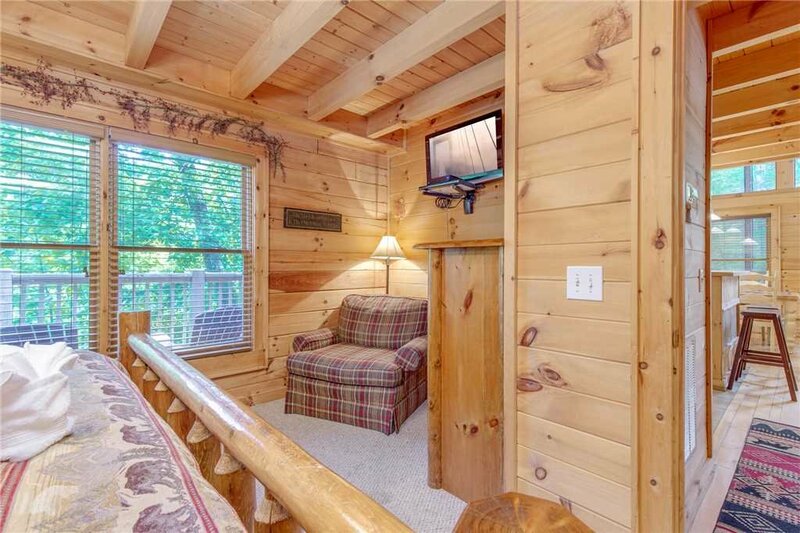 Sleeping up here is a bit like staying in a deluxe treehouse. 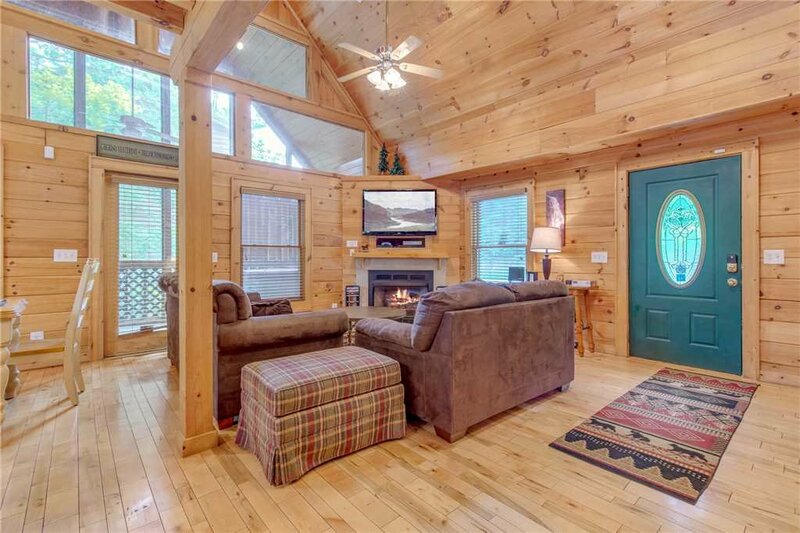 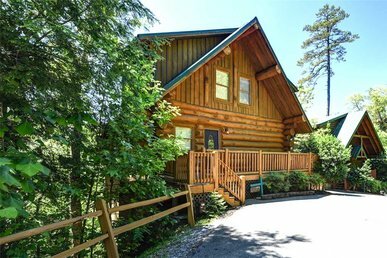 Gentle Ben’s Den is located in Gatlinburg’s Mountain Shadow resort. 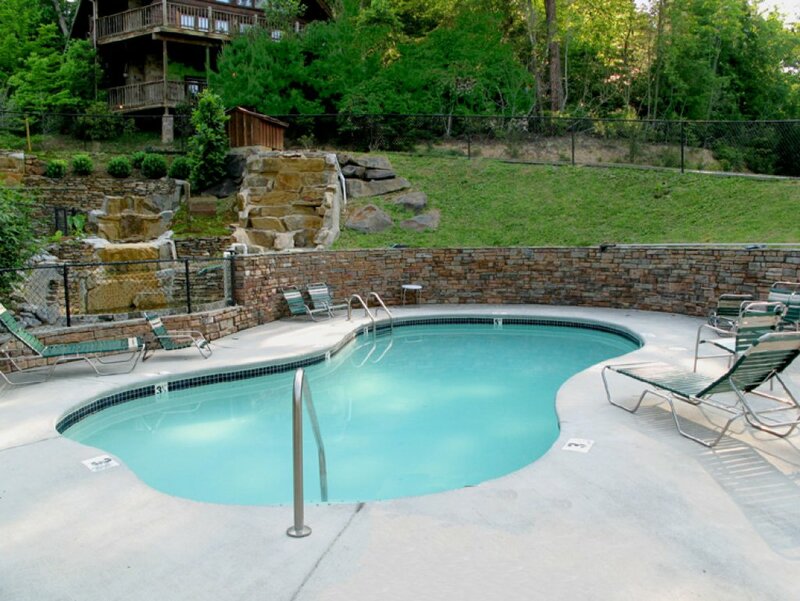 In summer you can swim in the resort’s outdoor pool and lounge on its poolside patio; year-round the kids can have a blast in the resort’s playground. 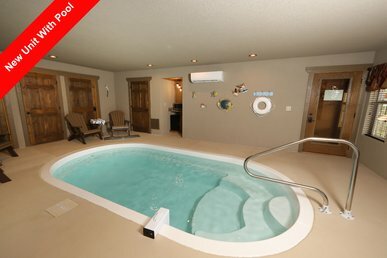 Just as important, the resort is only a hop, skip, and jump from numerous attractions. 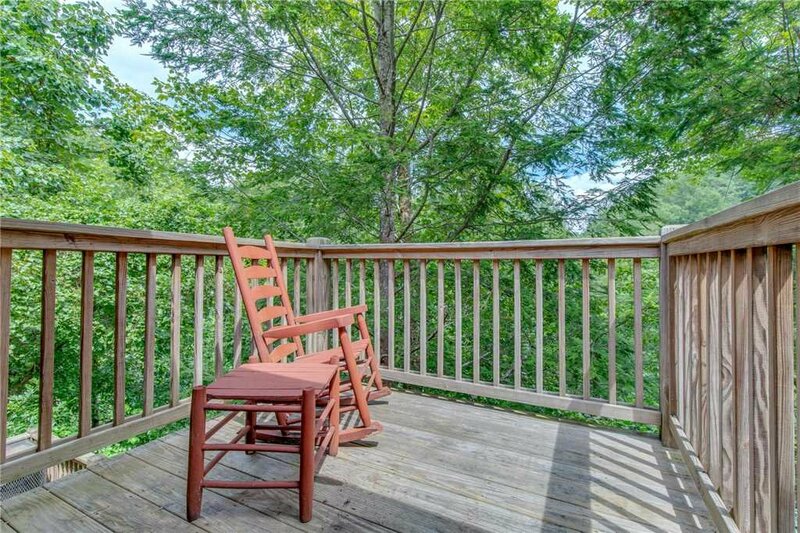 You can drive to the Great Smoky Mountains National Park in ten minutes. 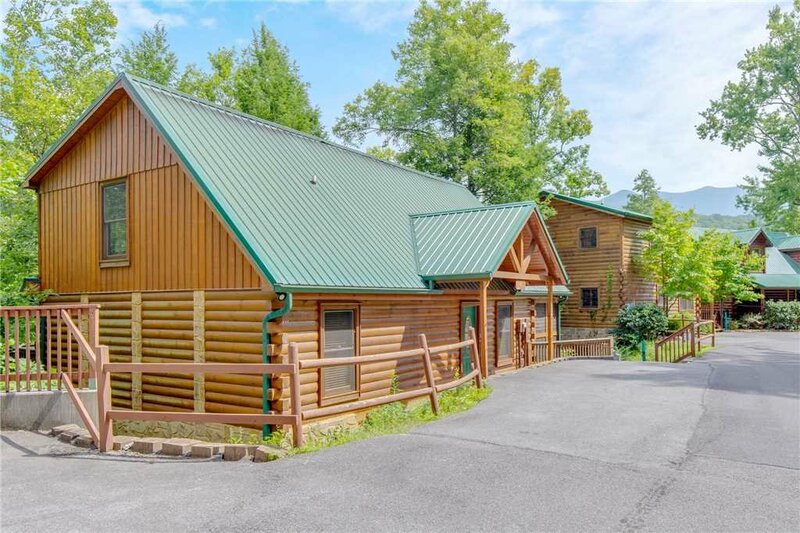 Downtown Gatlinburg is equally close; once there you can explore Ripley’s Aquarium of the Smokies, the Anakeesta outdoor entertainment complex, shops, arcades, amusement centers, and more. 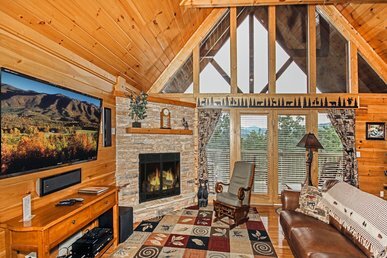 One thing’s for certain: When you stay at Gentle Ben’s Den, you’ll never be bored! 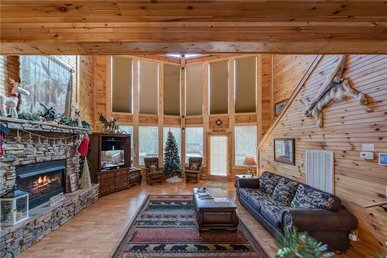 Book your reservation today, and get ready to make memories that will last a lifetime.